You’ve probably seen people wearing electronic devices on their wrist increasingly. Whether an electronic smartwatch or a smaller, lighter fitness tracker. Should you get one, and if so what type should you get? The reasons to get a fitness tracker can vary considerably depending on your personal interests. Are you going to focus only on fitness? Or do you want to explore all the latest technology, and do as much as you can on a wrist device? Even if you end up getting more features than you want in a new device, it’s important to know what the critical features you need are. This way you can ensure the device has those capabilities at minimum and ensure that they will work well. Be sure you are prepared to invest the time in setting it up, learning how to use it, and charging it. The more complicated the device is, the more time you will need to plan to work with it. Also, be sure you’re happy with the way it will look. The more features it has, the bulkier and heavier it may be. Smartwatches tend to be much larger than traditional watches and may not be apparent in photos on a shopping site. Note that many smartphones already have fitness capabilities built in, however it’s more cumbersome to make use of smartphone based fitness tracking. 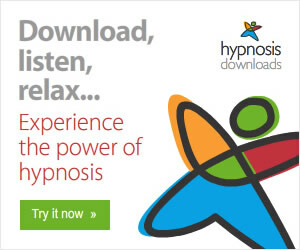 You must remove phone from pocket or purse, unlock it, and load the app. And each time you do that, you’re using the better more. A fitness tracker allows you to simply turn your wrist and view your steps progress. The first thing to consider is whether you want a smartwatch or a fitness tracker. Most smartwatches have some fitness capabilities; however, they are much more costly, bulkier on the wrist, and need more frequent battery charging. You also must be careful that the watch works with your phone. For example, if you have an Android phone, you don’t want to buy an Apple watch and if you have an iPhone you don’t want to buy a Gear watch. 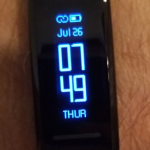 Fitness trackers generally have a watch feature to show the time, however they tend to have a smaller screen that doesn’t look like a traditional watch and tend to have a bigger focus on fitness than on integration with a phone. Fitbit is one of the more well-known names, however you pay a very large premium for the brand name and doesn’t necessarily have the features you want. The main features most want in a fitness tracker is displaying the time, tracking your steps, and heartrate. People also want to have a phone app that can communicate with the tracker successfully and meets their needs. Some trackers have additional features to vibrate and display text messages, calls, and more. Some offer sleep monitoring, however we feel this is of limited use. Sleep is when most would charge their devices, and many not feel comfortable sleeping with it on their wrist. Also ensure your tracker has an adjustable screen timeout value, and even better if the screen can come back on through motion rather than having to press a button. The features of the fitness tracker may depend on the application. For example, while the tracker should show you your total steps, you’d need the application to see your history or the goals for the day. 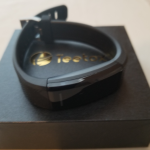 I tested the Teetox fitness tracker, which surprisingly was only $20 here with Amazon yet had all the features I want. I had the Teetox fitness tracker synced up and working with the Android app within 5 minutes, and tested the step tracking, heart monitoring, SMS text notifications, and sleep tracking successfully. It also worked great with Whatsapp notifications. The user interface of the device as well as the application were very straightforward and easy to navigate, and was very comfortable on my wrist. Below are a few photos of this device. The feature to have it turn on by lifting my arm was very nice, allowing to quickly and easily see the time. 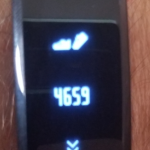 The method of charging with the Teetox fitness tracker was interesting, you simply pull the band off one side, and then one end of the main part of the tracker can plug directly into a USB port. I recommend one of those wall surge protectors or strips that have USB charging ports on it. Don’t buy the first tracker you see in the store or a friend recommends. Decide the features that are important to you, your budget and how you’d like it to look. Ensure you can return or exchange it if you aren’t happy with it. You may want to start with a simpler lower cost fitness tracker the first time, to gain familiarity this type of device and then consider whether you want to later invest in something with more features such as a smartwatch. Lastly, be sure to use it as intended. The most important part of a fitness tracker is tracking your steps towards a daily goal and making it very easy to see where you are. Set a goal that challenges you. The device I tested came with a default goal of 10,000 steps but is adjustable to whatever goal you want.